Nicole Meath is a board certified, Family Nurse Practitioner and oversees the Arizona and Las Vegas Region. Prior to obtaining her degree as a Family Nurse Practitioner she worked at Scottsdale Osborn for 10 years, and was a ICU Trauma nurse for 7 years. While earning her advance degree she started working at the Phoenix Veterans Memorial Emergency Room for 2 ½ years until graduating. 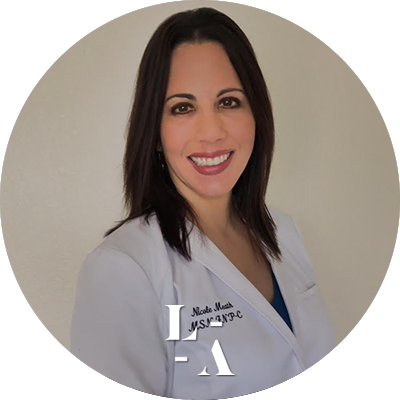 Before accepting the role as Regional she worked at Minute Clinic and sought additional learning opportunities at a Naturopathic Aesthetic office and Medical Dermatologist to advance to her career in Dermatology. An advocate of international service, Nicole has also completed six medical missions to Nicaragua, El Salvador, and Honduras, wherein she was responsible for assisting with triage and the selection of Pre-Operative care, Surgical Assistance, and Post-Operative Care with patients. She holds advance certifications in neuromodulators and fillers, and is a member of the American Association of Nurse Practitioners, Arizona Nurse Practitioner, and Dermatology Nurse Association.